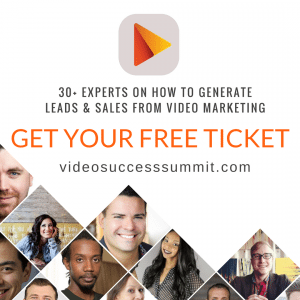 Is your Business using Video Marketing yet? Imagine creating Facebook video posts that result in well over $100k in sales in just a few months. Picture yourself generating hundreds of new leads per week. What if you could make 6 figures in revenue in less than a year? If you’ve been thinking video marketing is just for the really big players, think again. 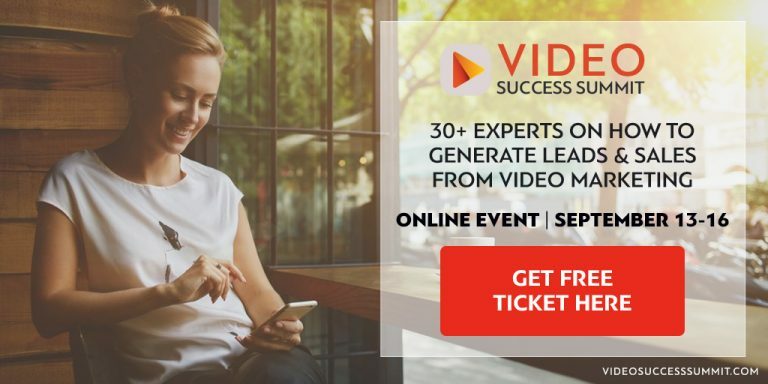 The examples above are all achieved by the speakers at the Video Success Summit where 30+ experts will teach you their secrets to Video Marketing. These are real, hard-working people, just like you. What makes them different is that they have figured out the value of video… and how to profit from it. As an official event sponsor we’ve been given a limited number of complimentary tickets to give away – and we’re inviting you! The speaker sessions will give you real, actionable advice that you can start implementing today. It’s like having a good friend you can ask for advice. No fuss and you don’t even have to travel – it’s all online. These are just a few examples of the step-by-step strategies you’ll get from the 30+ expert speakers. The summit is completely online – all you need is an internet connection and you can enjoy the event from wherever you are! Don’t wait – the free ticket is only available for a limited time.